Exactly a year ago today we all started on a splendidly challenging patchwork adventure. Where ever did that year go? It’s not every year you get two presents a week, but that is exactly what happened during our Splendid Sampler year! I have made about 40 of the blocks and some have been a real challenge I must say! This is block 100, designed by Kate Spain. I am going to make all 100 blocks (in my own sweet time) and am looking forward to completing my very first sampler quilt. If you are just learning about the Splendid Sampler, don’t worry it’s never too late to get started! Join the Facebook group and buy yourself a copy of the book and you’ll be a ‘Splenderette’ in no time! 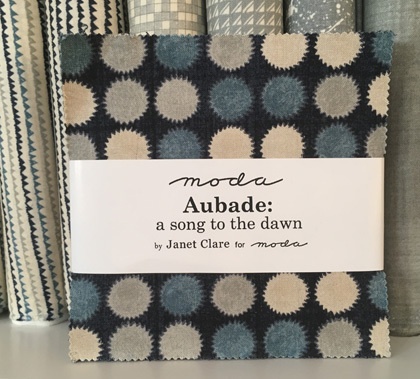 and in a week I’ll pick a random name to win a 5″ charm pack of my latest fabric collection for Moda ‘Aubade: a song to the dawn’. ‘Aubade’ was inspired by the sunrise and the promise of a whole new day, everyday. 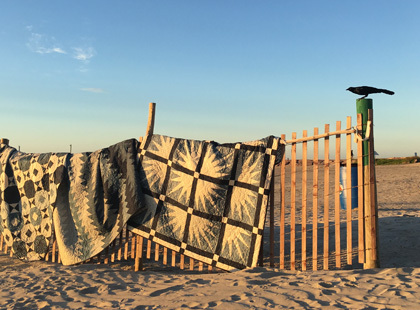 I designed three quilts specifically for this collection and here they are enjoying the dawn on a Texan beach. I also designed an embroidery thread collection with Lecien which matches my favourite colours and fabric lines beautifully. My ‘Sky’ embroidery floss collection will be available from quilt shops soon- pop in and ask for it! 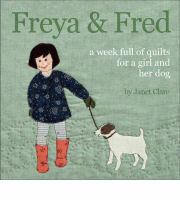 And there will be many more chances to win- pop over to the Splendid Sampler to find out more! I have learned that even with very different looking blocks, using a complementary colorway can bring them all together. I love the way your blocks look all together. Thank you for the sweet giveaway. I can’t wait to find some Aubade in my LQS. I learned how to paperpiece. This has been a wonderful and challenging year. That scraps reproduce! I am making my blocks with scraps but they aren’t getting any less! I am loving the variety in these blocks and am really enjoying making them. About 30 more to go. My favorite thing about the splendid sampler is how different all of the blocks are-there really is no limit to creativity! I think that is the best lesson. I remember seeing your beach photos on Instagram. I used to live in Galveston and now live on the mainland closer to Houston. I learned how to piece small pieces accurately! I learned that even if you go scrappy, using a cohesive color scheme will pull everything together. Thanks for the chance to win! I have learned that it is okay to be free with fabric choices. I have so enjoyed seeing everyone’s blocks throughout the year. I learned how to make your beautiful birds and venture out to make many more from “Little English Brown Birds” I love to paint with thread now and to use rough edge applique! I have learned not to be afraid of little pieces and different techniques! Some of the squares were definitely challenging, but I finally finished them. But the part I liked best was looking at the squares of others online and meeting new friends from all over the world. That was amazing to see where Everyone was from!! I have learned that it takes more patience for me to make a 6″ block then a 12.5″ block, even if they have the same # of pieces. The Splendid Sampler taught me that there is always something new to learn. Everybody was so helpful with tips and suggestions and new ideas. Thanks to all the designers. This project has taught me that I could use some lessons in embroidery, but have really enjoyed the experience. I haven’t been able to start the quilt yet because of making quilts with deadlines, but I do want to make it. I have really enjoyed being introduced to some new to me designers. 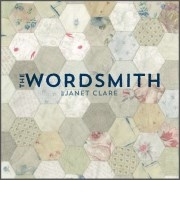 The splendid sampler has taught me to talk about quilting to people I don’t expect To be interested. I have a friend who I didn’t know sewed join the group and loved it. This sampler taught me that I don’t have to keep up I should just enjoy the adventure! I’ve learned a lot about applique. Done it a few times before but forgot about half I’ve known and the sampler was a great refreshment. loved learning new techniques, such as hand embroidery the most! I had never done any embroidery before doing The Splendid Sampler. I’ve learned that I love it! And I also love hand-stitching around applique, something I’d never been brave enough to try previously. I loved the surprise each time: which designer? what pattern? which technique? So happy when I saw you were one of the designers! SS opened my eyes as to all the different piecing techniques and embroidery work that can make beautiful works of art. I learned so much and have 100 Blocks and many bonus blocks to now put into my own work of art. Thank you Janet for your contribution to the project and for the giveaway. Love your work ! It has taught me new techniques. I loved learning about how much variation there can be in a single block. I loved seeing the different designers’ takes on the same block. Such fun! That I shouldn’t be scared to try something, I just might like it (or at the very least learn something)! I have learned that anything is possible. I have learned to slow down to achieve better accuracy and have enjoyed learning new techniques. It’s been a blast!!!! I’ve learned how the same block can look so different depending on the value and color choices used. I have learned that the choice of fabrics can change the look of a block drastically. I learned patience, glue and starch are your best friends. Also, I learned to love paper piecing. I think both my embroidery and paper piecing improved as a result of doing these blocks. I also loved being able to use my scraps to make these blocks. I learned so many new techniques that improved my sewing! My last 20 blocks are sooo much better constructed than my first 20! I learned that I can do any technique I put my mind to! Of course, I found some that I definitely do not want to do again, but I did them once! Lol! I learned the importance of accurate cutting and that 1/4 seam allowance. I gained more confidence as the year progressed and I got more comfortable sewing such small pieces. It was refreshing to get an easy block every so often as well. Thanks for your part in this journey. I haven’t started yet but I know I will like the mix of techniques. I just loved doing all the different techniques. Learnt a lovely te about foundation paper piecing. Not as scary now.. I have learned just how many tiny pieces of fabric you can fit into a 6.5 inch square! Foundation paper piecing has become my new love! I learned that although I started with the intention of making a completely scrappy quilt, I really preferred the ones with a restricted color selection. And I like all the sashing. The blocks are very busy when placed side by side. Giving them space to breath sure seems to improve things. 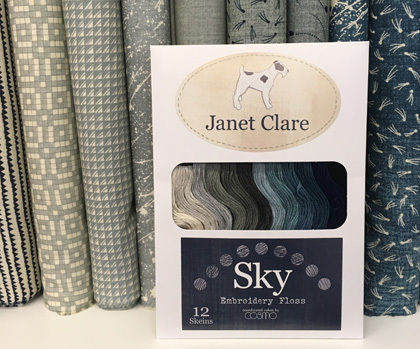 Love your new fabric line! I liked the challenge that the Splendid Sampler gave me… there were blocks that I would never have tried if I hadn’t been a part of the challenge. I still have lots of blocks outstanding too! I’ve learned that 6” blocks don’t really take much time to make! Honestly, taking the time to learn and do the embroidery portions has been a challenge. I learned to paper piece. I have tried in the past, but just didn’t get it. Love the whole process. I learned that I really love working on small projects and with scraps! I picked up some tips and honed many skills. I have learned cutting and sewing accuracy this year along with many new techniques like applique and EPP. All of the blocks have been so much fun to create. What an exciting adventure for the year. Thanks to all who helped make this project a success. I have learned to take my time and sew as accurate as I can. It does make a difference. The most splendid part of this sew along besides the super cute blocks and the fun surprise waiting every Thursday and Sunday was meeting other quilters from all over the world and discovering we are all a lot alike. 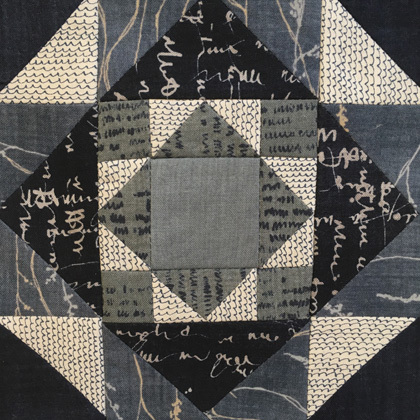 It’s fun to see all the blocks and quilts – and how far different people have “traveled” on their Splendid Sampler journey. Love, loved the journey. I am no longer intimidated by PP or Applique blocks. What a great idea to do this as a great big Quilt a long. The other quilters inspired me in so many ways. I also learned the importance of color placement. So glad I participated. I have 108 blocks now ready to put into multiple tops. I learned to paper piece something I was a little scared to learn. I love the variety of techniques during the sampler – lots to try out!!! I have learned a lot about color and what colors go well together. I have not had a lot of success with color theory on my own. Thanks! I learned so much about sewing small, teeny, tiny pieces!! I’ve done more embroidery than I usually do, so I’ve seen improvement from the practice. 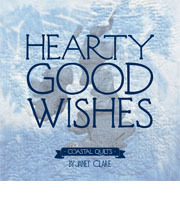 I have learned what an amazingly supportive and creative group quilters are. I learned how to do English Paper Piecing. The whole project was so much fun! the splendid sampler has taught my a lot about how to work in the quilting world as this is my first really big project. I have loved every minute of the splendid sampler!! It has been so much fun seeing everyone else’s blocks and they have been a real source of inspiration for me!! I learned two new techniques…English Paper Piecing, and machine applique. It has been fun learning these as well as brushing up on some of the other techniques!! I am about half way through, but this has given me so much inspiration and motivation, that I am sure I will get all 100 done in due time. I learned some new techniques. i really enjoyed the variety of blocks. I didn’t have the time to commit to this quilt along last year. But I hope to purchase the book and work on it at a slower pace. The Splendid Sampler has taught me that I can’t keep up with a QAL like this! Love the blending of styles from all the designers though! I have not made any blocks yet but have collected all the patterns. The Splendid Sampler has introduced me to a lot of designers that I didn’t know about before. I thank all of you designers for the wonderful blocks. I’m just starting on the journey but have been following along. I’ve learned that I really love all the different colorways and how different colors look together. The Splendid Sampler has taught me to not be afraid of trying some of these techniques, and that if something didn’t work out exactly right for a block, it’s only a small amount of fabric and can be redone (though there are a few I “invested” so much time in I’ll wait a while before trying them again). I have learned that I’m not as good at paper piecing as I thought I might be. I love the colors of your fabric line!! This quilt along has taught me to try new things without worrying about the end result. The fun is definitely in the process. I learned how versatile any one block can be. Different fabrics create a whole new mood and look! Thanks for the Splendid Sampler! I have learned that paper piecing and curves are a little harder than I thought. But that is not going to stop me. I would say, it has challenged me to try new techniques. I have learned about contrast! I am doing a much better job of choosing fabric now. I thought needle turn applique, which I’ve done for the first time. SS has taught me to be patient, try things I’ve never done before, and be happy with my attempt. The splendid sampler has taught me that patchwork isn’t all about hexagons! Hi Janet. Thank you for your contribution to the Splendid Sampler. It has been an enjoyable journey. Although I have only done 18 blocks, I have already learned several techniques I had never heard of previously. Your straight stitching around raw edge appliqué is a perfect example. I learned to ‘bee brave’ and try new things. I have collected all the block patterns and intend to try them all eventually. I learned that 6″ blocks can become addictive! I figured out that I favor brights in colors and have a hard time moving into other other options. I’ve really enjoyed using the different techniques in the Splendid Sampler. I avoided applique at all costs, but the 6″ blocks were perfect practice! So many new techniques! So many ways to use color! Hard work pays off! And other quilters can be a great encouragement. Before starting the Splendid Sampler, I never even heard of English paper piecing, and now I can do it! Well, not very well, but I will keep practicing. I loved doing al the different blocks , lots of fun. I have learned how great quilters are. Each block was a wonderful treat that the designers have shared with us and helped us to learn and grow by trying new things. I learned patience from all my Splendid Friends. It’s not a race and with a long way to go, I plan to enjoy every step and stitch. Thank you, a lovely charm pack. I thought that beach looked familiar. I’m in Texas too, along the gulf coast. Love your quilts. And, I’ve really learned so much from this journey. I think I learned most, that I can make any block. That in itself is a great accomplishment. Some blocks were more of a challenge than others. I have enjoyed the journey. Quilt-alongs are not a race. Seeing the blocks of others can spur one to action. I have learned to the importance of precision & have tried harder to do that. I’ve improved my paper piecing skills. I’ve learnt to be more accurate with my cutting and piecing. I can see the improvement between my first and last block. I learned I love paper piecing. I had never done it before the SS. 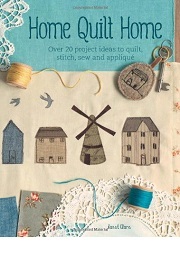 Now I am looking for my next paper piecing project. I wanted to learn and the splendid sampler was the perfect adventure to teach me. I love all the discoveries I made, like paper piecing, embroidery, appliqué and sewing curves. I learned to try techniques that I wouldn’t have tried. Thanks! I have learned to challenge myself to try new techniques. It’s surprising how just trying is sometimes all it takes. I have learned that colors I didn’t think would work together can play very nicely side by side! Now I can be bolder and more unexpected in my color combinations. 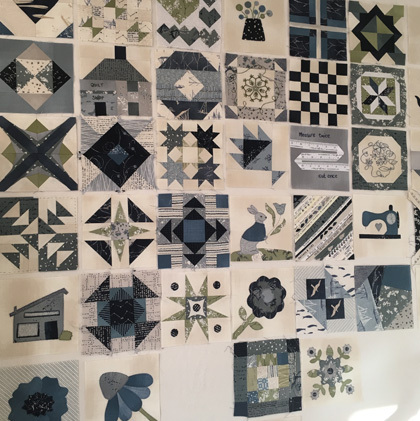 I have learnt to be patient – my foundation paper piecing skills have improved as I slow down and take my time – never being afraid to undo / start again! I learned I could stay committed to a long term project with use just one line of fabric. I haven’t had the sampler on my radar. I love the blocks you’ve made and the way you’ve kept the colours constant over the year. I learned that I really, really love pie. cing and I really, really dread hand stitching. But even though I dread it, I love the results! I love the way the Splendid Sampler pushed me into doing something I had been thinking about for awhile and the way it stretched my creativity as for every block I made from the sampler, I made one or two of my own design. Thank you all for sharing! Paper piecing! So daunting at first, but now I love it and actually look for ways to use it! Thank you for you generosity in this journey. The Splendid Sampler blocks taught me several new techniques. I learned that accuracy in cutting and piecing is really important, even more so in smaller blocks. I have gained so many new SS friends and found new designers to inspire me. I learned it idol to go at my own speed Slow……. Hoping to win your beautiful fabric. I wanted to make the SS as a push to start quilting again! It worked. It has taught me improvement on my skills to a point I didn’t expect from one quilt. This quilt-along has taught me English paper piecing. I think the thing that inspired me most about the splendid sampler was that it made me get out of my comfort zone. Trying different techniques and using them together in the same quilt are things I don’t usually do. I love piecing and usually stick with that. The applique, paper piecing and embroidery really offered challenges that I don’t normally attempt. It taught me to think outside the box. If I wanted to embellish the block I could! The Splendid Sampler taught me more about color, value, intensity etc just by looking at all the wonderful pictures of everyone’s block. Thanks! I learned to take my time on handwork. Then I got really far behind, but at the start of 2017 I had more time so I organized my blocks according to techniques and this helped me get more done. I did a lot of paper pieced blocks one after another and they went fast since my mind just remember each step. This also helped with machine applique blocks. When I had several to do I’d set up the machine for the applique. Now to finish the hand embroidered blocks. The Splendid Sampler taught me to applique. I’ve learned that even the tiniest bits can be tamed with paper piecing! I really want to learn paper piecing. Hola Janet: He aprendido a combinar mejor los colores de las telas y a sacar partido de los retazos más pequeños. he Splendid Sampler taught me how to paper piece which I did not ever think to do before. I am almost 1/2 way and have enjoyed every one of the blocks. The Splendid Sampler experience taught me that I can learn new skills and also have a beautiful quilt to enjoy. The Splendid Sampler taught me to persevere and not to be so picky about everything matching exactly. I’m on number 70. I learnt the importance of colour value and contrast! Thank you for the giveaway. I learned so much from the splendid sampler. My favorite has been how to sew and keep points! Thanks so much for giving us chance to win. I learned many new techniques, specially paper piecing through this journey. Loved your Flying High block too!? Hi – thank you for your contribution to The Splendid Sampler. I learned how to Paper-piece and epp from this. Loved every minute of it. Thank you.